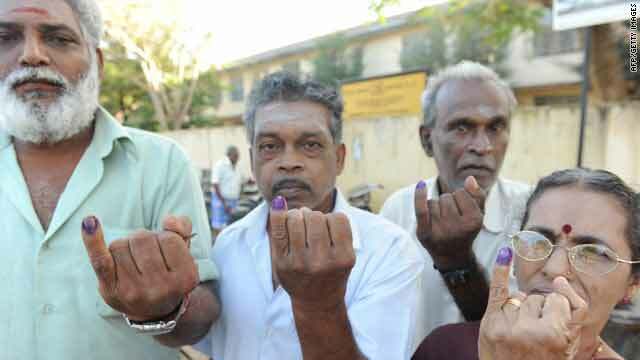 War displaced ethnic Tamils show their inked fingers after voting in Vavuniya, Sri Lanka, on Tuesday. (CNN) -- Sri Lankans went to the polls on Tuesday in the island nation's first peacetime presidential election in 26 years, despite explosions and mortar fire in the capital of Northern Province hours before polls opened. Once a stronghold for the rebel Liberation Tigers of Tamil Eelam, the Northern Province city of Jaffna was a frequent battleground for the rebels and Sri Lankan government troops until a government offensive last year crushed the Tigers. While it wasn't clear what the explosions were, they were nothing new for Jaffnans, who have lived under military control for decades. More than 14 million Sri Lankans are expected to elect their sixth executive president to a six-year term. Sri Lankan President Mahinda Rajapaksa is seeking a fresh mandate for his government, but he faces a tough challenge from his one-time confidante and former Army commander, retired General Sarath Fonseka. Rajapaksa cast his vote in his ancestral town of Medamulana, near the southern town of Tangalle. "I am very confident of victory," he told journalists. Fonseka was expected to visit a polling booth in Colombo. Queues were large outside most polling booths in Colombo and principal towns, election officials said. "I waited in a queue for 45 minutes before I could cast my ballot," said Damayantha Perera of the Colombo suburb of Maharagama. "I also had to wait for almost an hour," said W. Ramiah, a resident of Nugegoda, also of Colombo. Fonseka, who won wide acclaim for leading troops to military victory against the rebels, broke ranks with the Rajapaksa administration after he was elevated to the largely ceremonial post of chief of defense staff in July after retiring as Army commander. After Fonseka announced his presidential bid, the main opposition parties -- with widely diverse political ideologies -- closed ranks behind him to make him their common candidate. "There has been abuse of power, corruption and nepotism. We want to abolish the executive presidency and make the parliament more answerable to the people. The best person to do this is the one who defeated terrorism," Ranil Wickremesinghe, leader of the United National Party, told CNN. Many of Rajapaksa's family members, including his brothers, hold key positions in the government: Chamal is a Cabinet minister, Gotabhaya is Defense Secretary, and Basil is a member of parliament and senior presidential adviser. Other members of the family hold important positions locally and in Sri Lanka's diplomatic missions abroad. The coalition of parties backing Fonseka includes a main opposition right wing party and a leftist Marxist outfit, as well as the Tamil National Alliance. Paikiasothy Saravanamuttu of the Center for Policy Alternatives, a branch of the Centre for Monitoring Election Violence, said the situation in Sri Lanka, however, is "a picture of dysfunction and breakdown." There have been allegations of interference with mail-in ballots, according to the group. Most of the complaints have been against members of Rajapaksa's government, it said. There have been more than 700 reports of violence ahead of the election, with at least four deaths reported, Saravanamuttu said. Sri Lankans are casting their ballots in more than 11,000 voting booths across the nation. Local leaders have urged a peaceful voting day amid the escalating violence, including the shooting deaths of two people -- one a supporter of the opposition and the other of the government. A contingent of 85,000 police officers have been deployed to maintain law and order, said Mahinda Balasooriya, the inspector general of police. Each polling station has two to three police officers on duty, he said. The spokesman for U.N. Secretary-General Ban Ki-moon said last week that the U.N. chief was "concerned about the growing violence in the lead-up to the presidential election." "The peaceful conduct of the first post-conflict national election is of the highest importance for long-term peace and reconciliation in Sri Lanka," he added.